Mr. Patrick “Pat” R. Sheldon, age 72, of Douglasville, passed away Saturday, January 12, 2019. He was born in Frankfurt, Germany on September 27, 1946, son of the late Roy Sheldon and the late Miriam. Pat earned his undergraduate degree from Birmingham Southern University and earned his law degree at Tulane University. He worked for the United States Army as Chief Council for 44 years. He was a member of the Douglasville First United Methodist Church. 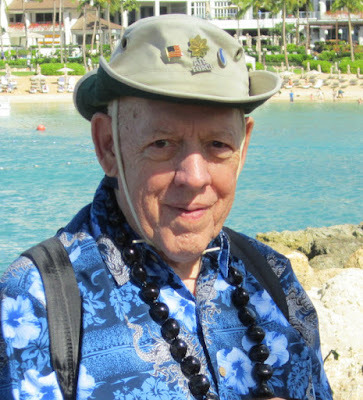 Pat was an avid golfer, an animal lover, a former antiques dealer and collector. He had collections of golf clubs, coins, and stamps. Pat is survived by his wife of 23 years, Shelia Kay Bennett Sheldon of Douglasville; daughter, Jessie Bennett of Asheville, N.C.; brother-in-law, Robert Danny Bennett and his wife, Jackie of Alexander City, AL; sister-in-law, Sherry Diane Bennett of Suwannee, GA; niece, Karen Milton and her husband, Alan and their sons: Bennett and Daniel; niece, Lea Bryson and her husband, Christian and their daughters: Courtney, Catherine, Elizabeth, and Emma. In keeping with his wishes, Pat will be cremated and a memorial service will be held at Hightower’s Memorial Chapel on Friday, January 18, 2019 at 12:00 PM. The family will receive friends for one hour prior to the service. Do you know we experienced something neither our parents nor any generation after us has had the pleasure to live through? That is unless your parents were born before 1912. In 1912 both New Mexico and Arizona joined the union. In 1959, we were in school when we witnessed Alaska and Hawaii become states. Needless to say, no other states have been admitted to the union since then. Alaska became the 49th state on January 3, 1959 when I was in the seventh grade. Later in the year I had moved up to the eighth grade at Huntsville Junior High. Many of my former classmates at East Clinton Elementary School lived a little farther north than I did and had joined the ranks of eighth graders at Lee Junior High. I remember sitting in the classroom on the day Hawaii (or Hawai’i) became our 50th state and was probably unaware how historical such an event really was, or what it would eventually mean to me personally. One of the oddest things I remember about the event was how I felt I had wasted my time buying a 49-star flag for use in my Boy Scout troop. I remember the flag I was so happy to purchase was one which had one big flag with two smaller ones you had to cut off of the piece of material. All three of them had to be hemmed, which I did myself on my grandmother’s treadle Singer sewing machine. I had used the flag for less than seven months when it became obsolete. Of course we all knew about the attack on Pearl Harbor in Hawaii, but were normally only shown the battle footage of the attack. I suppose I was first made aware of Hawaii's other areas was when I was nine. That happened to me because I loved to go to the movies and especially loved war movies. I remember seeing From Here to Eternity, a 1953 American romantic drama film based on the novel of the same name by James Jones. The picture deals with the tribulations of three U.S. Army soldiers, played by Burt Lancaster, Montgomery Clift, and Frank Sinatra, stationed on Hawaii in the months leading up to the attack on Pearl Harbor. Deborah Kerr and Donna Reed portray the women in their lives. The film won eight Academy Awards out of 13 nominations, including the award for Best Picture. Although Hawaii seemed exotic at the time, it was not until a couple of months after statehood that we were allowed to view some of the island’s scenery when Hawaiian Eye introduced us to the island life. The American detective television series that ran from October 1959 to April 1963 on the ABC television network. Private investigator Tracy Steele (Anthony Eisley) and his half-Hawaiian partner, Tom Lopaka (Robert Conrad), owned Hawaiian Eye, a combination detective agency and private security firm, located in Honolulu, Hawaii. Their principal client was the Hawaiian Village Hotel, which in exchange for security services, provided the agency with a luxurious private compound on the hotel grounds. The partners investigated mysteries and protected clients with the sometime help of photographer Cricket Blake (Connie Stevens), who also sang at the hotel's Shell Bar, and a ukulele-playing cab driver Kim Quisado (Poncie Ponce), who had "relatives" throughout the islands. Engineer turned detective Greg McKenzie (Grant Williams), joined the agency later on as a full partner, while hotel social director Philip Barton (Troy Donahue) lended a hand after Tracy Steele departed. The show's debut coincided with several real-world developments that helped contribute to its longevity. These were the granting of statehood to Hawaii, the advent of mass tourism to the new state brought about by the introduction of jetliners for commercial passenger flights, and the promotional efforts of Henry J. Kaiser, whose real-estate projects in Honolulu included building the hotel complex originally known as Kaiser's Hawaiian Village (later the Hilton Hawaiian Village Hotel). Another TV series also took advantage of the lure of the new state as well. Still filmed in black and white, we were denied the beauty of the blue of the ocean and the green of the jungle and colors of the many flowers. Adventures in Paradise was an American television series created by James Michener which ran on ABC from 1959 until 1962, starring Gardner McKay as Adam Troy. He was the captain of the schooner Tiki III, which sailed the South Pacific looking for passengers and adventure. The plots dealt with the romantic and detective adventures of Korean War veteran Troy. The supporting cast, varied from season to season, featured George Tobias, Guy Stockwell, and Linda Lawson. And who can forget the beautiful color scenes we saw in the 1961 movie, Blue Hawaii with Elvis and all the girls in swimsuits and the beach scenes? 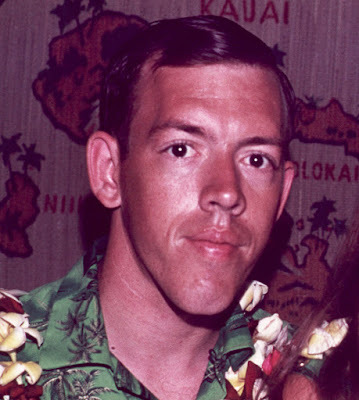 Later in 1968, several years after graduation, we were able to see Hawaii in living color when Steve McGarrett (Jack Lord) in Hawaii Five-O and in 1980 when we rode with Magnum P.I. (Tom Selleck), in Robin Master’s Ferrari. Now, both of those TV series are currently being remade with new actors. I never dreamed when I witnessed Hawaii become a state in 1959 that I would ever get to visit the island, much less travel there 17 times. The first of my visits was done 10 years after Hawaii became the 50th state. I had just finished earning my Air Force navigator wings and had a two-week break before I began my training as an Electronic Warfare Officer. I was stationed in Sacramento at the time and during the break my ex-wife and I drove over to Travis AFB and got a space-available hop on an Air Force C-141 to Hickam AFB on Oahu. We were there for a little over a week and stayed in a $6.00 a night bachelor officer’s room at Ft. DeRussy located right on Waikiki Beach. Over the next couple of years it was a stop-over on my way to Guam when I was a B-52 crewmember. After my retirement from the University of Memphis in 2008, Sue and I made it a regular vacation spot, just completing our 14th visit there last week, traveling on an Air Force C-17 (a benefit earned in my military retirement). One of those visits was a cruise taken out of San Diego and stopping at all four major islands. This time we were back on Oahu staying at the Disney Aulani Resort and Spa in a room that retails for $1,200 a night. Take a breath – we didn’t pay that! We used our Disney Vacation Club points instead of using them at Hilton Head Island this year. In conclusion, Hawaii became a state in 1959. 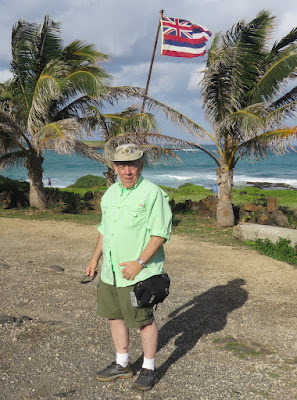 I first visited it 10 years after statehood in 1969. I last visited it in 2019, 60 years after it became the 50th state, and 50 years after my first visit. I don’t plan for that to be my last visit. Memphis, TN - I had a little problem with the original mailings last week because I only took my iPad to Hawaii with me and left my Windows PC at home. Unfortunately my mailing list was stored on the PC and my iPad was unable to pull it up. Hence, I had to use an older mailing list until I made it back home last Tuesday to get access to the current list. 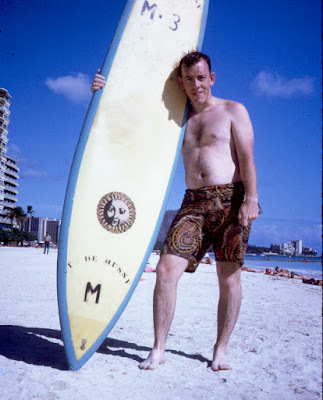 This week I put the knives stories away and take you away to the tropical paradise of Hawaii and our original memories of it. I wrote about From Here to Eternity earlier. Well, I have now walked and laid on the beach where Burt Lancaster and Deborah Kerr did their famous kiss as the waves broke over their swim-suited bodies back in 1953. It is a famous landmark for us older generation. I regret having to inform you of the death of Pat Sheldon so late. His is the obituary I lost a couple of weeks ago. As a senior I participated in the Diversified Education program. I remember that Mrs. Sumners was my teacher. I worked at Sno-Wite Drive Inn on Whitesburg. Some of you might remember long-time Huntsville residents Mr. Means and Jimmy Taylor. My job consisted of cutting the mustard and the homemade pies, as well as waiting on tables. The afternoon shift was manned mainly by young high school teenagers like myself, and, needless to say, a lot of young men frequented the establishment, among them young soldiers from Redstone. One night a good looking young soldier came in and the rest is history. He escorted me to our senior prom. We married in 1966 and, after almost 53 years we're still happily married - well, most days.